When you are looking at a rental property, ask yourself - can you see it as home? Most people will have a 'feeling' when they walk into a property, either good or bad, but it is important to balance out this 'gut instinct' with a good, solid appraisal of the property and the environment you will be moving into. You need to take into account the local area, what kind of amenities there are - and how close they are, and most importantly, the condition of the property and whether it suits your needs. Is the property secure - are the external doors sturdy enough and is there a good locking system? Is there a burglar alarm? Has the property ever been burgled? If so, have the locks been changed since? Is the property outside in good condition? Are there any damp patches, traces of vandalism, misplaced bricks or anything that might signal a problem? Is there a garden, front, back or both? Are you expected to maintain the garden? What is the overall area like? Is everything you need within close reach? Are there any gangs hanging around the street corners, are any of the cars parked nearby damaged? Is there a bus shelter? These are notorious meeting places for gangs and are often the focus of vandals’ attention. Ask about the neighbours - have there been any complaints about them? Are there young/teenage children or animals in the properties adjacent to yours or in neighbouring flats? If possible do go back to the property and check in the evening as well as the daytime, as most people will be at work or school during the day and you may get a much clearer idea of any problems you may face if you take up the lease. Is there central heating in the property? If so, check all the radiators are working. Is there double glazing? If not, your heating bills may be higher than you'd expect. Look inside cupboards and behind curtains - is there any exposed or loose wire, faulty plug sockets or lights that don't work? Check the storage space - is the property big enough for you and your belongings? Are the rooms of a reasonable size? If unfurnished, imagine the rooms furnished - they look far bigger when they are empty! Are fittings and furnishings - carpet/curtains included? If there aren't any will they be in place before you move in or will you be expected to provide your own? Check the bathroom (s) next - flush the toilet, turn all the taps on and off and check for leaks or pressure. Check the bath for leaking areas and check that the shower works. If you decide to move in, before you do so you will need to pay a security deposit. This is held by the landlord to pay for any damage you cause to the property or its furnishings and fittings that needs to be repaired or replaced when you leave. This is why it is so important that there should be an inventory made and signed by both parties when you move in, and checked and signed again when you leave. Inventory checking can be extensive in the case of fully furnished properties, but it really is imperative. If you don't do so, it's their word against yours, and usually the law sides with the landlord unless you can prove otherwise. The inventory should include carpets, curtains, furniture, furnishings, kitchen equipment – absolutely everything that can be moved or is considered a feature of the property. The inventory should be drawn up by the landlord or letting agent previous to you moving in and you should just be able to sign it when you are happy with what is on it. Take your time and check every single thing on the list, adding anything that you think that should be noted that is missing. Also if you see something such as a stain on the carpet or broken pane of glass, make sure you note it down on the inventory as you may well find that the landlord will assume (or claim) that you caused the damage and keep your deposit in lieu of repairs when your lease is up. When you are renting a property and the lease has come to an end it is imperative that you or your representative go over your inventory with the tenant before they hand back the keys. If you do not do this, then it cannot be proven that any damage to the property was caused before they handed back the keys and any claim you make on their holding deposit will not stand up should you be taken to court. You should arrange a meeting between you (or your representative) and the tenant on the day they are due to move out, and go over the inventory listing together. Any issues can then be discussed and ironed out on the day. 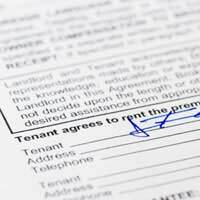 Make sure you ask the tenant to sign for any deposit waiver agreed in respect of damage to the property or damaged/missing items from the inventory.